January’s issue of Southern Living had a recipe for homemade condensed cream of mushroom soup. I’m glad to know I am not the only cook that has a love/hate relationship with canned cream of mushroom soup. It’s a secret weapon in my pantry and recipe books: an ingredient I rarely talk about and certainly never brag about, even though it sure does hold a lot of food together. But food snobbery aside, it is high in sodium and fat, and contains a few things I can’t pronounce, and would rather not eat. And it’s no longer a cheap ingredient. It was possible at one time to buy cream-of-anything soup at the low price of 4 for $1. Then the sales went to 3 for $1, then 2 for $1 and now you’re lucky if you find it for under a buck per can. That’s where this recipe entered the scene. It is not an ultra frugal recipe (although if you find fresh mushrooms marked down, it could bring the cost down considerably.) My guesstimated cost was somewhere around $8 to make this batch. But it is significantly lower in sodium, and has no preservatives. I modified Southern Living’s version…not on purpose. I dumped in the whole quart of heavy cream before I realized it only called for half that amount. But the final results were what I was looking for, and after using almost half the soup in a couple recipes, I was left with the equivalent of four cans concentrate. They are in my freezer, waiting for the next recipe that calls for condensed cream of mushroom soup. Here’s Southern Living’s version and here’s my modified version. Cook, stirring, over medium-high heat until the mushrooms sweat out their juices and the juices evaporate – approximately 10-12 minutes. This step takes the longest and you really want to keep a close eye on them. Remove the mushrooms from the pan and set aside. Add the remaining butter and flour; whisk into a roux and let bubble for a minute or two over medium heat; do not let it brown. Gradually add the cream, whisking smooth. Add the cream cheese and stir until smooth. Re-add the mushrooms. 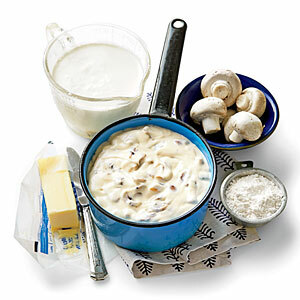 The mixture should be velvety and thick – much like the texture of condensed cream of mushroom soup. Cool and divide among 7 or 8 small (10 or 12 ounce) freezer containers or quart-size freezer bags. I portioned out 7 generous servings from this recipe but I’ll stretch it to 8 next time. Thaw before using. For additional modifications, you can try substituting half-and-half for some of the heavy cream (it may make it “soup-ier”) and low-fat or no-fat cream cheese. Better-than-Bouillon also makes a reduced sodium concentrate that would reduce the sodium content even further.